I would love to find out what to do with my zucchini, yellow, and patty pan squash. 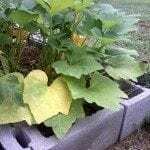 The problem is that the middle of the plant, the 'heart' of the plant, is like eaten or burnt. It has brown and crunchy leaves, but only in the middle of it. What could it be? Please help me. I live in northen Arizona.